The granddaddy of all Wood River Valley summer youth recreation programs is the one offered for more than 30 years by the Ketchum Parks and Recreation Department at the wonderful Atkinson Park facility. You certainly have to be young-at-heart to attend. There's something going on all the time at the park. All you have to do to participate is become an official "Park Rat" by signing up and hanging out all summer. Jen Smith, director of parks and recreation, said in the 2011 summer brochure, "We continue to offer activities that promote sportsmanship, inspire creativity and enrich learning for your kids while fostering a sense of fair play and distinguishing the crucial role that physical and intellectual activity plays in our lives. "Ketchum Parks and Recreation is proud to be the only all-inclusive four-season municipal parks and recreation department in the Wood River Valley. Let the fun begin!" Skateboarding, tennis, baseball, flag football, golf and swimming are just some of the activities. Add to the mix things like volleyball, mountain biking, soccer, rugby, art, lawn games and lots of playground time. You'll make new friends and have fun just being outdoors and moving constantly. The Ketchum program has helped raised a couple of generations of kids since the late 1970s. Among newer offerings are the family-friendly "Tennis 101" program on the fundamentals of the game, and the Ketchum Bike Park across the street from the park. A new Kids Educational Garden is a great resource for the impressionable kids. On hand to guide the kids and run the programs are recreation supervisor John Kearney, youth recreation supervisor Bobby Noyes and Recreation Center supervisor Maggie Burbridge, plus a youth staff consisting of college and high school athletes, and past Park Rats summer alumni. Dedicated to your child's well-being, the park staff boasts years of summer experience. Open registration begins Friday, May 6, at 8 a.m. at the Atkinson Park Recreation Center for the Summer 2011 Youth Recreation Program. It offers two sessions—June 13 to July 14 and July 18 to Aug. 18. The sessions are split into Monday and Wednesday, and Tuesday and Thursday. Enrollment is open to kids entering third grade and some activities are planned for high school kids. The Atkinson Park Dolphins Swim Club and tennis programs are attractive offerings for many campers. "The bulk of our programs are for fourth- and fifth-graders, but even middle school kids and some high school kids can find activities they can enjoy," Kearney said. Affordability is an important feature of the park summer programs. Scholarships are offered. No child is turned away because of finances. Fees are $40 for each activity over each five-week session. Or you can pay $20 daily (from 9 a.m. to 4 p.m.) and enjoy all activities. Kids in grades 3-6 who plan to stay at the park all day must either register in four activities or pay the daily rate. To help ensure your child's space in any activity, it's best to hand-deliver your form to the Atkinson Park office. You may also fax it to 726-5501, or mail it to City of Ketchum Parks & Recreation, Box 2315, Ketchum, ID 83340. Checks should be made payable to the city of Ketchum. Very popular are the Friday Adventures, pioneered by the Ketchum summer youth program, which send first-come, first-served entrants ages 8 and older on trips and out-of-town activities. They start June 17 and last through the end of August. Aug. 18-19—Doubles and singles end-of-summer tennis tournaments; also, on Aug. 19, another farm trip. Aug. 31-Sept. 2—End of summer campout. Special recreational opportunities this summer are the United Kingdom Recreational Soccer Camp from Aug. 22-26 (www.uksocca.com); Crazy Dress Day on Wednesday, June 29; and the "Park Rat Games" on July 13 and Aug. 17. The Park Rat Idol Talent Show and Bake Sale will be fun to watch and enjoy eating on Thursday, Aug. 4. Friday Fun Days for incoming second-grade students have been continued for this summer, on eight dates. They are June 24, July 1, 8, 15, 22 and 29, and Aug. 5 and 12. Cost is $70 for all eight sessions, or $10 per day. Youth staff lead activities like tennis, kickball and volleyball, but parent volunteers are always needed and welcome. As for all park activities, kids are grouped by the grade they are entering in the 2011-12 academic year. Program sponsors include the city of Sun Valley, Blaine County Schools, Zenergy at Thunder Spring, Blaine County Recreation District, Bigwood Golf Course at Thunder Spring, the Sun Valley Suns, Atkinsons' Market, Sun Valley Golf Course and DDRM Companies (golf course and tennis facilities). The majority of the youth activities are conducted at Atkinson Park. 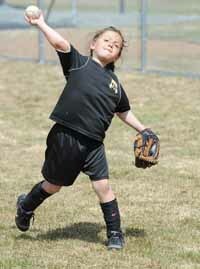 For information, contact the park at 726-7820 or visit www.ketchumidaho.org for signups.